A new electricity rate proposed by PG&E for electricity customers would simplify time-of-use metering for electric car owners, and lower off peak rates to the equivalent of $1/gallon gasoline. There is plenty of electricity in the electric grid to fuel millions of electric cars, especially if the majority of electric car charging is done at night. Because many electricity plants cannot slow down at night-time, when electricity demand is low, there is a lot of electricity going wasted at night. A large adoption of electric vehicles could time-shift electricity generated at night, to be used during the day to drive a car around. How, then, do "we" encourage electric car owners to do the majority of charging at night? 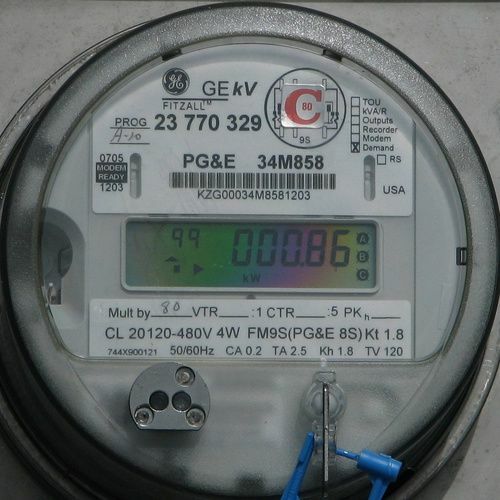 The answer many point to is "time of use metering," a common feature of business electricity service, but uncommon for retail electricity customers. Commonly retail electricity customers pay a flat rate for electricity, whether or not it is consumed at night. For PG&E customers (Northern California) that's known as the E-1 rate. Retail PG&E customers can switch to either the E-9A or E-9B plan, getting time-of-use metering and electricity price. PG&E, recently filed a proposal with the California Public Utilities Commission (CPUC) proposing revisions to the E-9 rate that would create a new rate called "Schedule EV" specifically meant for electric vehicle owning electricity customers. The letter updates a proposal filed last September, because that proposal drew 76 letters of protest, including one written by Plug In America. The new proposal is being greeted by applause from not only Plug In America, but the NRDC's Max Baumhefner who said that with the new proposal PG&E (the biggest electric utility in California) has taken "an important step to give drivers access to a cleaner fuel that’s roughly the equivalent of buck-a-gallon gasoline." Electricity can be an extremely cheap fuel, especially if the electricity is bought at night, but only if electric car owners are properly incentivized with low electricity rates when electricity is cheap. Unfortunately the E-9 rate is incredibly complex, outdated, and according to Plug In America the E-9 unfairly penalizes electric vehicle owners. The flat electricity rate (E-1) does nothing to incentivize electric car owners to charge at night. Instead, says PIA, "low off-peak rates are key to sending the market signal consumers need to shift their charging habits." Night-time wholesale electricity prices are so cheap that in some cases it is "dollar cost negative," meaning the electric plants have to PAY others to take electricity. Passing along a cheap cost for electricity to electric car owners would be a huge incentive to do the right thing and charge the car at night. PIA described last Septembers proposal as only benefitting "those who are the top 25% of energy users" and destroying any incentive to use energy-saving devices. For example an electric vehicle owner who had installed a photovoltaic system would, by PIA's analysis of last September's proposal, "be subject to up to 80% increases in the cost of their electricity to charge their EVs," which is a perverse circumstance to foist upon those doing the most to make environmentally positive choices. The new rate, Schedule EV, would be a "non-tiered time of use" system. It is the tiered aspect of the earlier proposed E-9 changes which drew PIA's criticism. Second, the new proposal removes a $8/month charge, however for the EV-B plan (that has a separate meter for the electric car) there is a $1.50/month charge for the meter. Third, the new proposal significantly decreases the per-kilowatt-hour rates. The EV-A proposed rate (one meter for the whole house) is: In the summer, Peak (2-9PM) $0.35656/kWh, Partial Peak (7AM-2PM, 9PM-11PM) $0.19914/kWh, and off Peak (all other times) $0.09712. In the winter, Peak (2:00-9:00 PM) $0.26694/kWh, Partial Peak (7AM-2PM, 9PM-11PM) $0.16472/kWh, and off Peak (all other times) $0.09930/kWh. The EV-B proposed rate, which has a separate meter for the electric car, is very similar. The times given for Peak, Partial Peak and Off Peak are for weekdays, the new proposal increases the number of hours of Off Peak rates on weekends and holidays. On the E-1 rate, the highest tier, for those who use the most electricity, currently runs $0.34/kWh. Even though an electric car is environmentally positive, it does increase ones electricity consumption, which could push one into the higher tiers. Schedule EV eliminates the tiered rate structure, and gives a huge incentive to shift major electricity consumption to the 11PM-7AM time period. By Max Baumhefner's calculations, posted on the NRDC's Switchboard blog, an electric car fueled by PG&E's proposed off-peak rate, $0.09930/kilowatt-hour, "is equivalent to driving a 30 mile-per-gallon conventional vehicle on $1.00/gallon gasoline." He goes on to note that the 1949 price for gasoline was $0.268/gallon which, after inflation, is $2.42/gallon in 2010 dollars. A curious detail in the PG&E proposal is that Schedule EV does not apply to "low speed electric vehicles and electrically powered motorcycles or bicycles." One understands why it might not apply to LSV's (aka NEV's) or electric bicycles, because those vehicles have small battery packs. It is puzzling why it applies to electric motorcycles, especially given the huge strides in the electric motorcycle industry, for example the recently unveiled Brammo Empulse R has a top speed over 100 miles/hr, a city riding range of over 100 miles, out of a 9 kilowatt-hour battery pack, and rival Zero Motorcycles isn't far behind. These modern electric motorcycles are not the electric scooters of recent years, but are becoming real motorcycles. One thinks the PUC and PG&E simply aren't hip to the latest advances. If the CPUC approves Schedule EV, it will take a few months for PG&E to rework their billing systems to accommodate the new rates. Those who are on E-9 today will have the option to remain on that plan until 2015, or can switch to the EV rate. "Because many electricity plants cannot slow down at night-time, " The type of plant with this problem? Coal. So PG&E is hoping more EV owners will use coal power for their cars. Aaron, you are correct that it's not good to use coal energy for anything, even powering your house, right? That's why plug-in vehicle advocates always work for renewable energy to power out homes and cars. It's incredibly easy, and in most cases, cost effective. After buying a 3 kW PV system in 2002, then buying an EV that same year, I have driven 105,000 miles on kWh generated from the sunlight falling on my roof. My electric bill averages a mere $100 per year for both the house and car. My solar system paid for itself as of last year. For the rest of my life, I get free energy from the sun. Before you say anything negative about EVs, please consider the full picture. We need these cars, fast. Two problems: 1) in California, your situation might be great, but where I live, it isn't. EVs aren't the only answer, just one of them. 2) those panels won't be good for the rest of your life unless you're very old. 10 years on average, 15 at most, then they'll require replacement. Before you go putting all of your eggs into the EV basket, consider the full picture. We need DIVERSITY in cars. Fast. Aaron, I don't know where you live, but in Germany, where the climate is similar to Oregon, they have the highest per capita use of solar in the world, so chances are that it'll work where you are, as long as you don't have shade on your roof. If you can't install solar, then you can sign up for your utility's renewable energy program and then run your house on wind energy. You should do that today. I'm not sure where you got the notion that solar panels only last 10-15 years. That's clearly not true. Manufacturers warranty them for 25 years, but the PV systems installed in the 70's when they first came to market are still working. Life span of solar PV is measured in decades. I don't put all of my eggs in one basket, but it's important to note that electric vehicles running on renewable energy is the single best way to go IF you need a car. I live in Wyoming. Bitter cold and the hail we get regularly (just had a huge storm last week) make solar untenable. No warranty from solar makers covers that kind of damage. We do (and I have) wind power, but that's only useful when there's enough wind to run it. Most PV panels are warrnated for 10-25 years, depending on which ones you're looking at. The kind that would be useful here (non-silicon "mattes" for metal roofing) have only 10 year warranties. Panels lose their capacities over time as well. Our utility doesn't have a renewables program because there are no wind generators a part of our electric grid. Every electron goes to California (Wyo produces about 1.3GW annually and growing). Our power is from a natural gas plant, however, and is extremely cheap. Our monthly electric is usually $40 or less. With the drive into civilization being 45 miles each way and the availability of plug-in parking being non-existent, an electric car is not viable here. Which is why I call for diversity. We have natural gas in abundance. East of us on the other end of Nebraska is serious soybean country (the source for most biodiesel). North of us are coal and gas deposits that are considered the largest in the world. David Herron is one of the best writers on this subject. Thanks for taking a very mundane and complicated subject and explaining it in terms most can grasp. And thanks to those who pushed to have this outcome. I think this is a perfect option for those who can shift their heavy energy use to off peak. It's not rocket science, this should have been done a while ago for whole house. Now that we have the smart meters, it'll be easy to implement across the board. Voluntary at first, but ultimately compulsory. It's one step toward making dirty energy pay its way. EPA says 33.6 kWH in a gallon of gas. How does this rate plan equal $1/gal? Also, in order to get this overnight rate, you pay a LOT for your daytime usage. How about allowing multiple providers in PG&E's territory? I'll choose SMUD (R-1) 10c up to 700 kWH then 17c/kWH.